Chiang Mai is Thailand’s second major city and the capital of the north. It is located in the Himalayan foothills and used to be the capital of the Independent Kingdom of Lanna (1296–1768). It’s is a wonderful city to visit, perhaps making the top 20 cities of the world in our opinion. There are over 300 temples in the Chiang Mai area dating back to 1296 when the city was founded. Here is a list of our top picks for Chiang Mai temples in and near to the Old City. This mountain top temple is a must see if you visit Chiang Mai. You can travel to, and explore this temple in about two-four hours since it is only 13km outside the city. The climb up to the temple is a little tough because the staircase is steep, but you don’t need to be super fit to make it up. Doi Suthep was founded in the 14th century and today is the most important temple for Theravada Buddhists in the north of Thailand. It is a journey every Thai Buddhist is recommended to make at least once in their life so it is not just a temple but a pilgrimage too. Wat Chedi Luang is particularly beautiful and also imposing. The structure was damaged during an earthquake in 1545, but it remains mainly intact. The massive elephant carvings are a wonderful photo opportunity, and is one of the most photographed aspects of all the Chiang Mai temples. The temple is particularly lovely at night, when it is lit up. There is an ancient tree planted next to the city pillar, meant to protect the city and its grounds. This tree is huge and because of its sacred purpose, will not be cut down. This temple is located right in centre of the Old City and is is the largest temple within the old city walls. It was constructed in 1345 when a Lanna king built it in his father’s honour. The temple’s most sacred relic is the very old and famous, (now headless) Buddha called Phra Singh Buddha. According to legend, the Buddha came to Thailand from Ceylon to Ayutthaya and then to Chiang Rai, Luang Prabang and back once more to Ayutthaya.It arrived in Chiang Mai in 1767 where it has been ever since. An historic scripture repository is also located at this temple. Repositories were designed to protect the delicate paper sheets used by monks and scribes to keep records/document folklore. The walls of the temple are covered with murals illustrating Lanna customs, dress, and scenes from daily life. A unique aspect of Wat Umong are the corridors under the temple. No one really knows why they were made. They still have visible paintings from the 14th century. This temple is close to Wat Suan Dok and is a great chance to get out of the city into the countryside and see a temple in a lovely woodland setting. This temple, constructed in 1371 is built on what were once a 14th-century Lanna King’s gardens. Some of the temple’s Chedis contain ashes of the old Lanna Royal Family. You can also view a Buddhist relic brought from Sukothai in 1371, which split into two a long time ago. The other half is buried at Doi Suthep. A 500-year-old bronze Buddha image, one of the largest in northern Thailand, is also at Wat Suan Dok and is well worth visiting. 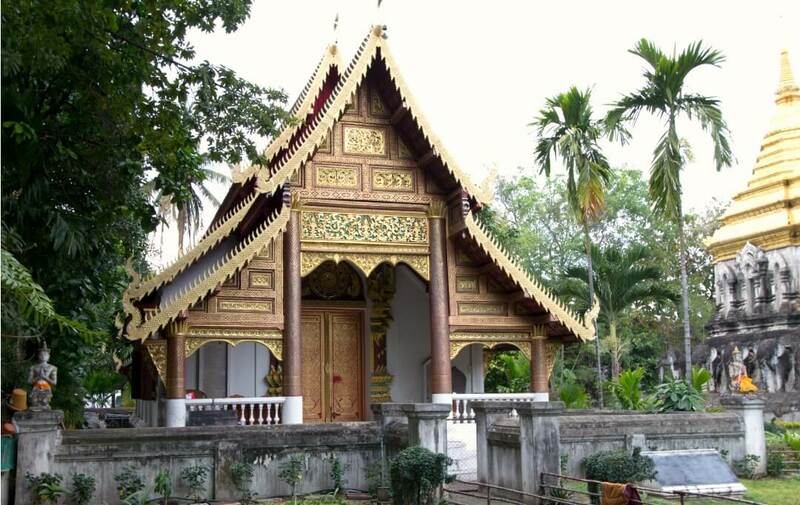 Wat Bupparam is located 500 metres outside of the Phrae Gate of the Old City. It was built in the 15th century, and houses beautiful statues and ornaments including three famous Buddha images, a painted wooden Buddha, a gold leaf Buddha, and green gemstone Buddha. The gardens surrounding the main building are filled with flowers and statues, some kinda quirky – you should check it out for yourself! The 400 year old Chedi also has a Burmese influence and is guarded by the typical Burmese golden lions. Wat Jed Yod is situated near to the Chiang Mai National Museum on the northern loop of the ring road. Built in 1455 by King Tilokaraja, its name means “Seven Spires”. It was modeled on the Mahabodi Temple in India, where the Buddha supposedly achieved enlightenment. The Chedi contains the ashes of King Tilokaraja who famously organised for the World Buddhist Council to come to Chiang Mai. Wat Jed Yod was built to host the Eighth World Buddhist council which was a massive honour for the Kingdom of Lanna at that time, so of all the Chiang Mai temples, if has great relevance to the history of the Buddhist religion. The main temple of Wat Pan Tao is constructed entirely of teak panels supported by 28 massive teak pillars. It is one of the few remaining all wooden structures of its sort in Chiang Mai. It has a three tiered roof with golden colored roof finials, shaped as Naga snakes on its roof ends. Wat Srisuphan was built in 1502, although little remains of the original temple. The temple is now the focus of renovations that started in 2009 and are designed to make it a centrepiece for the ‘silver village’ it serves. The entire surface of the hall, inside and out is covered in silver, as is the roof, and all sorts of ornate silver statues, signposts and ornaments are being added. This is a modern masterpiece and worth a visit for sure. It is great to see a Thai temple decorated in silver rather than gold. The monks at this temple are particularly tourist friendly, always ready for a chat. Wat Pha Lat is a complex of small temples and beautiful stone statues that focus around the waterfall. The temple area is incredibly peaceful, blended into the nature in a wonderful way. There are no shops, no crowds, just the peace of a temple, stunning views and a waterfall. Given its setting and the peaceful nature of Wat Pha Lat, as a tourist you will have the most authentic Buddhist experience here of all the Chiang Mai temples. The walk up the hill to Wat Pha Lat takes 35-50 minutes from Suthep Road, and you should probably wear trainers to do it it. Orange robes wrapped around the trees to mark the path up the hill to the temple. Wat Pha Lat, means ‘Monastery at the Sloping Rock’.